Rose, H. (2012). Language learning strategy research: Where do we go from here? Studies in Self-Access Learning Journal, 3(2), 137-148. Language learning strategy (LLS) research has been on the decline since the mid-1990s, when there was a boom in strategy research. This decline is, in part, due to growing criticisms of categorizations of learning strategies (Dörnyei, 2005), the data collection instruments used (Dörnyei, 2005; Woodrow, 2005), and contradictory and questionable results (Hadwin & Winne, 1996). In more recent years some research has been conducted under the umbrella of terms such as strategic learning and self-regulation, which aim to distance themselves from the past problems of LLS research. This article uses a recent study of strategic learning to illustrate how strategy research can be conducted in the current academic environment. The study shows that research frameworks need to be context-specific rather than generalized across languages and learning tasks. The study also illustrates the usefulness of qualitative data collection instruments over previously and widely applied questionnaires. In a recent article in Applied Linguistics, I use the analogy of throwing the baby out with the bathwater to discuss the notion of thousands of published research articles on language learning strategies (LLS) over the past 30 years being discarded in the face of self-regulation (Rose, 2012). Indeed, language learning strategy research has faced a barrage of criticism in recent years, much of which is justified. The unfortunate result, however, is a field of research that once garnered much attention in the academic community becoming a field that many new scholars are hesitant to enter. In addition to this, the little research that has occurred in the last ten years tries to separate itself from LLS, by using the term strategic learning, which often includes the notion of self-regulation. Furthermore, we have also seen a number of models of strategic learning emerge in recent years to take the place that was once occupied by the LLS framework. These include Tseng, Dörnyei, and Schmitt’s (2006) model of self-regulation based on Dörnyei’s (2005) motivation control taxonomy, Weinstein’s (2009) model of strategic learning, and Oxford’s (2011) model of Strategic Self-regulation. With so many emerging models it has become difficult for the new researcher to choose an appropriate framework in which to conduct research into strategic learning. Also, the future uncertainties of new models of strategic learning research, coupled with the lack of research conducted within these models, have dissuaded new researchers from entering this area. A learning strategy in language learning has been defined as conscious mental activity that contains a goal or intention, an action to reach this goal, and a learning activity (Cohen, 2007). However, Cohen also notes contention among academics over this definition, in that not all learning strategies necessarily reflect these three factors. Self-regulation in language learning refers to the processes the learner uses to exercise control over learning. This term has also caused contention in the field, and some researchers use the term synonymously with autonomy and self-management (Cohen, 2007). There are obvious connections that link both learning strategies and self-regulation to self-access learning, as they share core notions of independent learning settings, learner-centredness, and the raising of awareness and knowledge necessary for a learner to exercise responsibility for their learning (White, 2008). 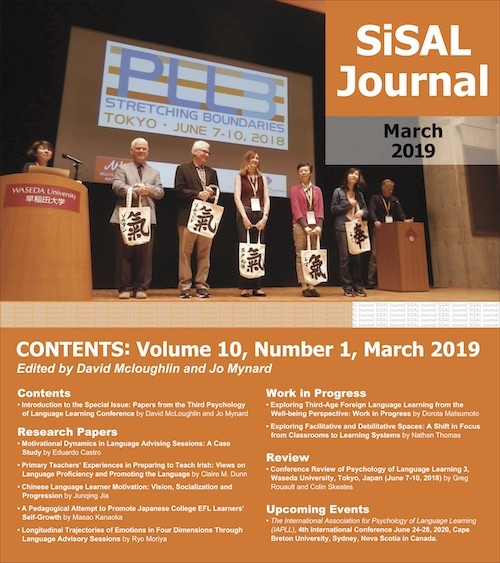 This paper uses a recent study of mine into the strategic learning of learners of the Japanese language to show how research in this field can be conducted in the current academic environment. It shows the implications of criticisms of LLS on research projects in terms of constructing research frameworks and data collection instruments. It is a hope the reader will see that we are moving into an exciting era of strategy research, where the researcher and practitioner have the freedom to explore context-specific actions of the learner. They are free to do this without the pressure to generalize findings beyond the context or the need to conform to flawed research frameworks from studies of the past. LLS research has been criticized in a number of key areas: categorization of LLS, the use of strategy inventory questionnaires in LLS research, and an over-generalization of strategy use across all aspects of language learning. These criticisms will be examined briefly. Even though researchers such as Joan Rubin, O’Malley and Chamot were pioneers in the field of LLS, it is the work of Rebecca Oxford that many associate with the rise of LLS strategy research. It is also her taxonomy of LLS that many researchers associate with strategy research, due to this being the preferred model of the time when it reached its boom in the early 1990s. However, Grenfell and Macaro (2007) state that even before the boom of research began there was considerable unease at the theoretical underpinnings of language learning strategy research. Indeed, Skehan back in 1989 called for re-theorization in the field due to conflicting methodologies and findings. Ironically, it took 19 years for an academic to launch a full attack of the Oxford taxonomy, when Dörnyei (2005) pointed out fundamental definitional issues with categories. However, Grenfell and Macaro (2007) claim that by the time of Dörnyei’s criticism the Oxford taxonomy was an out-dated model, and LLS research had moved on since that time. Nevertheless, even if Oxford’s taxonomy was on its way out, Dörnyei helped put the nail in the coffin. One thing is clear—taxonomies of language learning strategies are prone to definitional complications, which have to be addressed in the creation of a research framework in this field. Second, regarding the use of questionnaires in LLS research, much criticism stems from problems with Oxford’s once widely used Strategy Inventory of Language Learning (SILL)—a questionnaire designed to measure strategy use. Critics of the SILL argue that it is not an appropriate measure of strategy use (Dörnyei, 2005; Tseng et al., 2006; Woodrow, 2005). First, it can be argued that the SILL measures quantity of strategy use, rather than quality, which causes inaccuracies. As Tseng et al. (2006) point out, this causes students who use a number of strategies in a meaningless way to appear to be more strategic than students who applied a single strategy to a task in a purposeful and effective manner. This issue was addressed in a previous study, which stated: “Low reported strategy use is not always a sign of ineffective learning. Also reportedly high-frequency use of strategies does not guarantee that the learning is successful” (Yamamori, Isoda, Hiromori, & Oxford, 2003, p. 384). In addition to the SILL’s lack of precision in examining the quality in which a strategy is applied, a practice of computing mean scores from the SILL in numerous studies has sparked much criticism. Dörnyei (2005) argues it is not psychometrically justifiable due to the SILL’s measure of frequency instead of degree (always, sometimes, never), and its scale items not being in a linear relationship, meaning responses cannot be converted into a numerical form. In a comparison of the SILL with another strategy based questionnaire called the Motivated Strategies for Learning Questionnaire (MSLQ), Woodrow (2005) found the Likert scale of the SILL to be inappropriate because of contextual influences, such as cultural and educational background. Woodrow’s study concluded there is a general lack of reliability in using questionnaires to measure learning strategies, as they are not sample specific, and she calls for more qualitative methods. Discussion of context leads me to the next area of criticism of LLS research. The goal of very ambitious LLS research in the 1990s was to examine over-arching characteristics of the language learner that could be generalized across all aspects of language learning. A result was use of the same instrument (usually the SILL) in numerous studies, which aimed to draw comparisons of strategic learning regardless of the language learned or the context in which it was learned. The result of which were numerous conflicting studies, of which very few met rigorous research criteria (Hadwin & Winne, 1996). There were also a number of studies that, unsurprisingly, found LLS choice to be highly individualistic. Years later, Woodrow’s (2005) critique of language learning strategy taxonomies and research instruments emphasizes the need for sample-specific data collection techniques, and “a more situated approach utilizing in-depth qualitative methods” (p. 90). In a recent research project into the application of strategies in context, it was concluded that the “individual and situational context in which a learner operates is complex” (Takeuchi, Griffiths, & Coyle, 2007, p.92), thus supporting Woodrow’s claims. The study on which this paper is based will be outlined briefly, but it is important to note that this paper examines the theoretical implications of the study, rather than the results of the specific research questions. The overall research project examined the strategic learning of kanji (Japanese written characters), in terms of cognition and self-regulation. One of the secondary aims of the study, however, was to examine the appropriateness of self-regulation in a framework of strategic learning, as well as to highlight the strengths and weaknesses of a number of data collection methods used. It is the findings of this aspect of the study that is reported in this article. The study examined a group of 12 participants, who were learning the Japanese language at a university in the Tokyo area of Japan. The 12 participants were purposively sampled so that they represented a wide range of proficiency and assumed levels of self-regulation and cognitive learning strategy use. In terms of strategic learning the study aimed to investigate not only “good” advanced learners and “poor” beginner learners, but also “poor” advanced learners and “good” beginner learners. Kanji learning in this environment was largely self-directed, with lists of kanji given to students on a regular basis with little instruction on how to study them. The primary data collection instruments were bi-weekly interviews held over the course of an academic year, where participants discussed their kanji learning in relation to studying for bi-weekly kanji tests. These interviews included not only questions regarding the strategies used, but also their regulation of the kanji-learning task. A stimulated recall task was embedded within the interview structure. Students had to retake that week’s kanji test, voicing to the researcher the strategies they had used to memorize the kanji and also the strategies they were using to recall them. A questionnaire on kanji strategy use was adapted from a study by Bourke (1996), who created a strategy inventory of kanji learning. This was adapted to incorporate findings of research in this field since then, and to overcome the issue of the non-linear Likert scale of previous questionnaires such as the SILL. A second questionnaire was also added that measured the self-regulatory capacity for kanji learning (SRCKan), adapted from Tseng et al.’s (2006) SRCVoc for English vocabulary learning. The purpose of this paper is to investigate the appropriateness, including strengths and limitations, of a research framework that incorporates notions of cognitive and memory strategies with notions of self-regulation and motivation control. The implications of these findings will be discussed in a way they will be of use to a researcher wanting to conduct research in the field of strategic learning. This section, therefore, will first discuss the appropriateness of the framework, followed by a discussion of the appropriateness of the data collection instruments, before finally examining the appropriateness of a sample-specific qualitative approach compared to a large-scale quantitative one. In constructing a research framework, the study created its own framework based on literature on self-regulation and kanji learning strategies at the time, rather than using a generic framework that would not allow the context specificity that strategy research requires. As figure 1 illustrates, the framework looked at kanji learning from a cognitive and behavioral perspective. Cognitive strategies were adapted from Bourke’s (1996) inventory of kanji learning strategies, with some major changes to reflect ongoing research in the area of kanji cognition. Concepts on memory strategies and recall from the field of cognitive psychology were incorporated to add a new dimension to discuss kanji cognition. Non-cognitive strategies in Bourke’s original inventory were discarded, as a pilot study had revealed that the newer framework of self-regulation was more than adequate to cover the actions of how students regulated their learning in the kanji-learning task. Accordingly, the study also incorporated the notion of self-regulation from educational psychology, which was encased in Dörnyei’s (2005) motivation control taxonomy—a recommendation of Tseng et al. (2006). 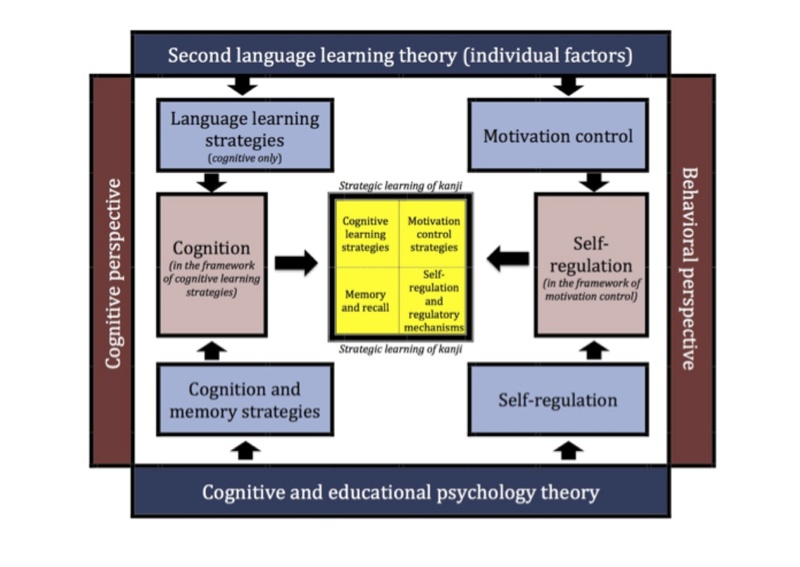 As literature on self-regulation in second language learning was scarce, much terminology from non-language related self-regulation was drawn upon in the discussion of the findings. This was particularly useful when discussing the concepts of goal setting, and the control of emotion and procrastination. Figure 1. The research framework of the study. The study found the framework to be very useful in painting a detailed picture of the strategic learning of kanji in this context, which included facets of learning strategies, motivation control, self-regulation and memory and recall. Even though the study found categorical issues with the motivation control framework (Rose, 2012), overall it was found that the addition of self-regulation within the framework gave the researcher insight into the struggles of the kanji learner that would have gone unnoticed had a more traditional framework been applied. Self-regulation also gave the researcher the language to categorize and compare the problems faced by the kanji learner, with problems faced by people in a whole array of situations covered by the umbrella of self-regulation research. Thus, it is clear that self-regulation adds a new twist on traditional frameworks that examine strategic learning. Simply put, self-regulation cannot be ignored in a research framework that examines strategic learning. However, it does not necessarily need to be encased in the taxonomy of motivation control, due to possible categorical issues (Rose, 2012). Instead, categories can emerge from data in order to develop a taxonomy, which is appropriate to the language-learning context. For example, a framework that examines self-regulation and LLS in self-access learning might look quite different from the one provided above, but may still include elements of cognitive strategies (mental processes) and self-regulation (the process of controlling one’s learning). The current study explored the concept of strategic learning both quantitatively in the form of a questionnaire and qualitatively in the form of semi-structured interviews and stimulated recall sessions. The results indicate that the qualitative data collection instruments provided a richer picture of strategic learning than the quantitative instruments. According to Tseng et al. (2006), “researchers need to apply other,more qualitative methodologies (such as stimulated recall andstructured observation) to achieve a fuller understanding ofthe whole picture” (p. 98) of self-regulation. In Woodrow’s (2005) critique of language learning strategy taxonomies and research instruments, she emphasizes the need for sample-specific data collection techniques. Benefits provided to the study by qualitative methods were many. For example, statements of commitment control by students on questionnaires alone were meaningless when compared from case to case, as the type and nature of commitments differed for each student. Without an understanding of these commitments through qualitative data collection, the questionnaire data alone was an unreliable measure. Similarly, perceptions of satiation and emotion control in the kanji-learning task were context specific and also not accounted for in a questionnaire. One participant, for example, whose commitment to kanji learning was low, felt he was able to control stress and boredom in kanji learning, and accordingly scored himself highly on the questionnaire in terms of his self-regulation over the kanji learning task. However, if this same student were to be placed in a context experienced by other participants—who had to study 2000 kanji in order to graduate—his ability to control stress may not have been the same. The questionnaire data alone did not account for these contextual differences in a way that the interview data did. In terms of cognition, while the Questionnaire of Kanji Learning Strategies provided a detailed description of the actual cognitive strategies employed by the participants in the study, these strategies were self-reported and at times inconsistent with the results of the stimulated recall sessions. An example of this is the over-reported use of pictorial association strategies in the questionnaire. Also, there were instances of use of strategies in stimulated recall sessions that were unreported on the questionnaire, such as one participant’s use of mnemonic strategies. These were recorded frequently in the stimulated recall sessions, despite the participant’s frequent denial in using this strategy on the questionnaire. Interviews revealed that the resistance to reporting use of mnemonic strategies stemmed from the negative stigma he associated with mnemonic usage. Thus, the qualitative data collection instruments appeared to be more accurate and richer measures of actual strategy use. Therefore, through the current study’s use of both questionnaires and in-depth qualitative data collection instruments, the findings support notions in the literature that qualitative data collection instruments are vital to the understanding of self-regulation and strategic learning. Future studies are encouraged to continue this mode of investigation. The current study’s findings illustrate a number of methodological considerations in the approach of future research, which are outlined in the following section. The main suggestion for future methodological design centers on the notion that qualitative, not quantitative, research methods are paramount to future research into strategic learning. The current study supports claims of the benefits of qualitative research and analysis. The interviews helped provide a “bigger picture” of self-regulation than the questionnaire allowed. Also the situated approach and qualitative methods allowed the study to address sample-specific issues that the questionnaire did not, thus supporting Woodrow’s (2005) claim. Finally, the interviews revealed a complex network of associations of aspects of motivation control that were unique to the kanji-learning task that would not have been observable through use of questionnaires alone, concurring with Miles and Huberman’s (1994) claims. Thus the potential for strategy and self-regulation research in a self-access learning context is immense. In conclusion, I hope the current study can serve as a road map on how to conduct strategy research in the current academic environment. It is my conviction that this is an exciting time to conduct research into strategic learning, because researchers are no longer bound by over-generalized and problematic models, and they are free to create new frameworks and explore the notion of strategic learning within specific contexts of language learning. Heath is an assistant professor of applied linguistics at Trinity College, Dublin. He holds a Ph.D. and M.Ed. from The University of Sydney. His doctoral and masters research focused on the strategic learning of Japanese kanji. More recently his research interests have expanded to ESP and CLIL curriculum design and Global Englishes. Bourke, B. (1996). Maximising the kanji learning task. (Unpublished doctoral dissertation). The University of Queensland, Brisbane, Australia. Cohen, A. D. (2007). Coming to terms with language learner strategies: Surveying the experts. In D. C. Cohen & E. M. Macaro (Eds. ), Language learner strategies (pp. 29-45). Oxford, UK: Oxford University Press. Grenfell, M., & Macaro, E. (2007). Claims and critiques. In D. C. Cohen & E. M. Macaro (Eds. ), Language learner strategies (pp. 9-28). Oxford, UK: Oxford University Press. Hadwin, A. F., & Winne, P. H. (1996). Study skills have meager support: A review of recent research on study skills in higher education. Journal of Higher Education, 67, 692-715. Hurd, S., & Lewis, T. (2008). Language learning strategies in independent settings. Bristol, UK: Multilingual Matters. Oxford, R. L. (2011). Teaching and researching language learning strategies. Harlow, UK: Pearson Education. Rose, H. (2012). Reconceptualizing strategic learning in the face of self-regulation: Throwing language learning strategies out with the bathwater. Applied Linguistics, 33(1), 92-98. Skehan, P. (1989). Individual differences in second language acquisition. Hodder Education. Takeuchi, O., Griffiths, C., & Coyle, D. (2007). Applying strategies: The role of individual, situational, and group differences. In D. C. Cohen & E. M. Macaro (Eds. ), Language learner strategies (pp. 69-92). Oxford, UK: Oxford University Press. Tseng, W. T., Dörnyei, Z., & Schmitt, N. (2006). A new approach to assessing strategic learning: The case of self-regulation in vocabulary acquisition. Applied Linguistics, 27(1), 78-102. Weinstein, C. E. (2009). Strategic and self-regulated learning for the 21st century: The merging of skill, will and self-regulation. Paper given at the Independent Learning Association Conference, June 4. Hong Kong. White, C. (2008). Language learning strategies in independent language learning: An overview. In S. Hurd & T. Lewis (Eds. ), Language learning strategies in independent settings (pp. 3-24). Bristol, UK: Multilingual Matters. Woodrow, L. (2005). The challenge of measuring language learning strategies. Foreign Language Annals, 38(1), 90–100. Yamamori, K., Isoda, T., Hiromori, T., & Oxford, R. L. (2003). Using cluster analysis to uncover L2 learner differences in strategy use, will to learn, and achievement over time. International Review of Applied Linguistics in Language Teaching, 41(4), 381–409.